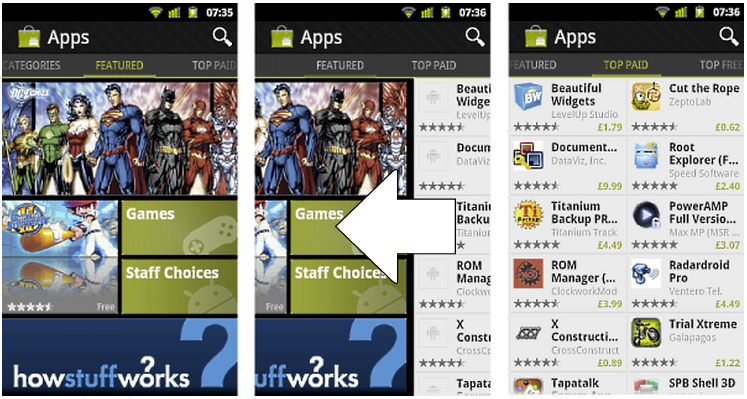 Perhaps you’ve seen some of the new user interface features available as part of the Android compatibility package. One such feature, horizontal view paging, allows for easy left and right swipes to load different screens (pages), controlled by a single Activity. This feature has been showcased in several high profile applications like the Android Market application and the Google+ Android client. There are a number of classes in the Android compatibility package that can be used to implement horizontal page swiping behavior in your Android packages. The ViewPager control (android.support.v4.view.ViewPager) provides the horizontal swiping behavior. It can be used within your layouts much like a Gallery or other adapter-populated user interface control would be. The PagerAdapter (android.support.v4.view.PagerAdapter) class is used to define the data displayed by the ViewPager control. Today we’ll look at a simple example of how to use these classes to provide swiping behavior. We provide the full source code for the sample application discussed in this tutorial. You can download thesample source code we provide for review. Horizontal view paging is based upon APIs only available with the Android Compatibility package v4, Revision 3; these APIs are not available in the standard Android SDK at this time. Therefore, you will need to add the Android compatibility package to your Android project to access the appropriate APIs. To add the Android Compatibility package to your Eclipse Android project, right-click on the project in the Project Explorer. Choose Android Tools, Add Compatibility Library. You will now see the android-support-v4.jar file in your Referenced Libraries project folder. This means you have successfully added the package to your project and can now start using it. Next, you’ll need to define a ViewPager control in your layout resource file. In our simple example, we update the main.xml layout resource used by our Activity class, and define a ViewPager control within that layout. This control must be referenced by its fully-qualified name: android.support.v4.view.ViewPager. ViewPager controls often take up the entire screen, but this need not be the case. For this example, we will display five different layout “pages”, thus we call our ViewPager control by a unique identifier labeled myfivepanelpager. Next, you’ll want to create a set of resources that will make up the “pages” or “panes” for horizontal swiping. You can use the same layout resource file for each page and add different content, or you can load completely different layout resources for the individual pages. For this example, we created five separate layout resource files, called farleft.xml, left.xml, middle.xml, right.xml, and farright.xml. Each layout resource has different contents to display. The contents of each layout resource are up to you. You can use static or dynamic controls. To keep this example simple, we’ll stick with static controls like TextView and ImageView controls. For the far left and far right pages, we’ll include some Button controls. There is nothing special about the implementation of these layout files. Don’t forget to implement any Button onClick handlers in your Activity class. These layout resources will be loaded by the PagerAdapter at runtime for display on the screen. For implementation details, see the source code that accompanies this project. Your ViewPager needs a data adapter to determine and load the appropriate content for each page the user swipes to. We have named our layout resource file “pages” in the order we want them to display, from far left to far right. When you extend the PagerAdapter class, you’ll need to implement several key methods. First, you’ll need to define the size of your paging range. In this case, we have a set of five pages to display. Therefore, you’ll want the getCount() method of the MyPagerAdapter class to return a page size of 5. Next, you need to implement the instantiateItem() method to inflate the appropriate layout resource file, depending on the user’s swipe position. The farthest page to the left is in position 0, the next page to the right is position 1, and so on. The instantiateItem() method uses the LayoutInflater service to inflate the specific layout and add it to the collection used by the ViewPager. The last important method you need to implement is the destroyItem() method, which removes the specific layout from the collection used by the ViewPager when it is no longer being displayed. Lastly, you need to update the onCreate() method of your Activity class to bind your MyPagerAdapter to the ViewPager control defined in your main.xml layout resource file. You can also take this time to set the initial position of the pager. By default, it would start at position 0 (the far left layout with the simple Button control). However, we want to allow the user to swipe left and right so we set the initial position of the ViewPager to the middle layout (the monkey in the middle) using the setCurrentItem() method. The horizontal view pager user interface control is a neat user interface control made available to Android developers through the Android compatibility package. Data for the individual “pages” is managed by a special data adapter called a PagerAdapter. There are also classes within the compatibility library for building fragment-compatible data adapters for driving ViewPager controls.